Home >> Our Providers >> D. Malcolm Barfield, D.O., F.A.C.O.G. Dr. Barfield is a Board Certified physician in the specialties of obstetrics and gynecology, and also performs advanced operative laparoscopy. Dr. Barfield completed his residency in obstetrics and gynecology at Emory University Affiliated Hospitals in 2004. He is a 2000 graduate of NOVA Southeastern University School of Osteopathic Medicine, and completed his internship at the Children’s and Women’s Hospital of the University of South Alabama. He holds a Bachelor of Science degree in microbiology from the University of Georgia. 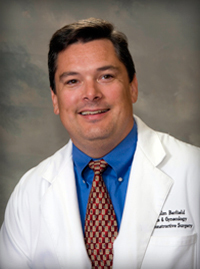 Dr. Barfield also is a co-founder and staff physician of Cartersville Ob/Gyn’s onsite outpatient surgical facility, the Georgia Advanced Surgery Center for Women.